Download "I just got arrested for a State of South Carolina DUI charge. What happens now?" 1 I just got arrested for a State of South Carolina DUI charge. What happens now? ISSUE ONE: The South Carolina Implied Consent Proceeding: Under South Carolina's implied consent law, a person who drives a motor vehicle in the state of South Carolina is considered to have given consent to chemical tests of his or her breath, blood, or urine for the purpose of determining the presence of alcohol or drugs or the combination of alcohol and drugs if arrested for a DUI offense. 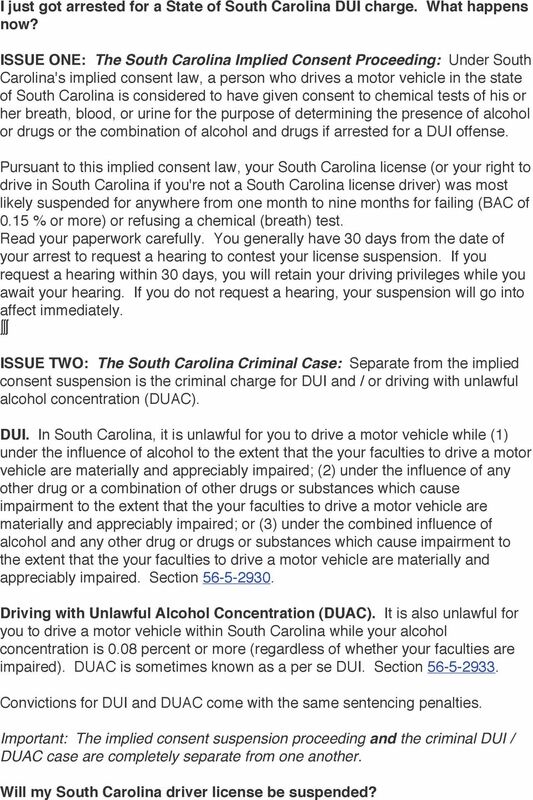 Pursuant to this implied consent law, your South Carolina license (or your right to drive in South Carolina if you're not a South Carolina license driver) was most likely suspended for anywhere from one month to nine months for failing (BAC of 0.15 % or more) or refusing a chemical (breath) test. Read your paperwork carefully. You generally have 30 days from the date of your arrest to request a hearing to contest your license suspension. If you request a hearing within 30 days, you will retain your driving privileges while you await your hearing. If you do not request a hearing, your suspension will go into affect immediately. ISSUE TWO: The South Carolina Criminal Case: Separate from the implied consent suspension is the criminal charge for DUI and / or driving with unlawful alcohol concentration (DUAC). DUI. In South Carolina, it is unlawful for you to drive a motor vehicle while (1) under the influence of alcohol to the extent that the your faculties to drive a motor vehicle are materially and appreciably impaired; (2) under the influence of any other drug or a combination of other drugs or substances which cause impairment to the extent that the your faculties to drive a motor vehicle are materially and appreciably impaired; or (3) under the combined influence of alcohol and any other drug or drugs or substances which cause impairment to the extent that the your faculties to drive a motor vehicle are materially and appreciably impaired. Section Driving with Unlawful Alcohol Concentration (DUAC). It is also unlawful for you to drive a motor vehicle within South Carolina while your alcohol concentration is 0.08 percent or more (regardless of whether your faculties are impaired). DUAC is sometimes known as a per se DUI. Section Convictions for DUI and DUAC come with the same sentencing penalties. Important: The implied consent suspension proceeding and the criminal DUI / DUAC case are completely separate from one another. Will my South Carolina driver license be suspended? 2 SOUTH CAROLINA IMPLIED CONSENT LICENSE SUSPENSION CHART (for persons 21 years and older) INCIDENT BAC 0.14% or less BAC 0.15% or more REFUSAL TO SUBMIT No priors in past 10 years None 1 month 6 months 1 prior in past 10 years None 2 months 9 months 2 priors in past 10 years None 3 months 12 months 3 priors in past 10 years None 4 months 15 months RELATED TO ISSUE ONE ABOVE: Your South Carolina driver license (or your right to drive in South Carolina if you do not have a valid South Carolina license) may be suspended in the implied consentproceeding for failing (0.15% or greater) or for refusing a chemical test. Again, you may challenge this suspension if you act within 30 days of your arrest. Speak to your South Carolina lawyer for more information. 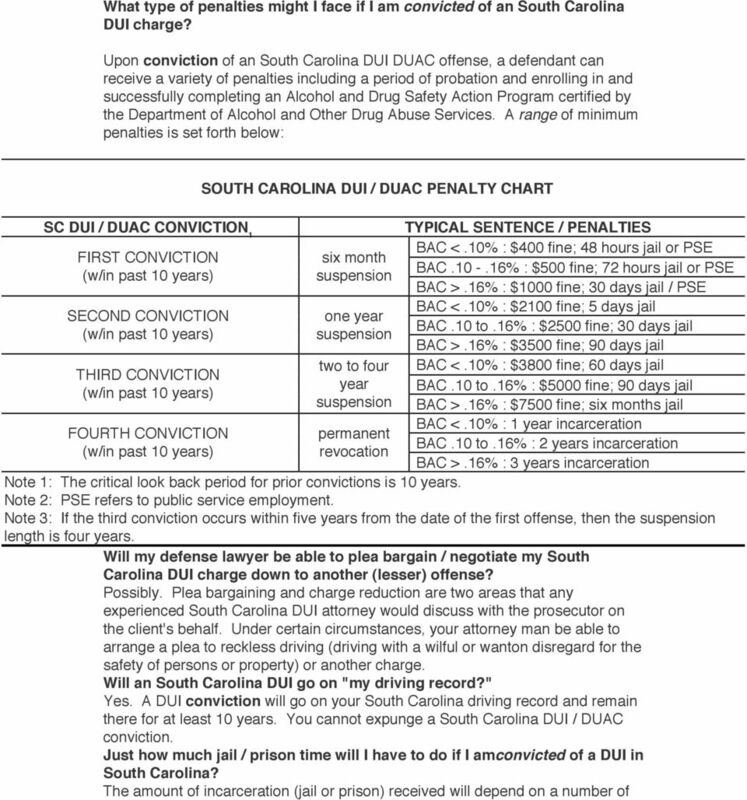 RELATED TO ISSUE TWO ABOVE: If you are convicted of the DUI or DUAC (driving with an unlawful alcohol concentration) charge, you will also lose your license (or your right to drive in South Carolina if you don't have a valid South Carolina license) for a six months or more depending on your DUI / DUAC history in the past 10 years. This suspension is separate and distinct from the implied consent suspension. Talk to your South Carolina DUI attorney for possible suspension lengths for your situation. 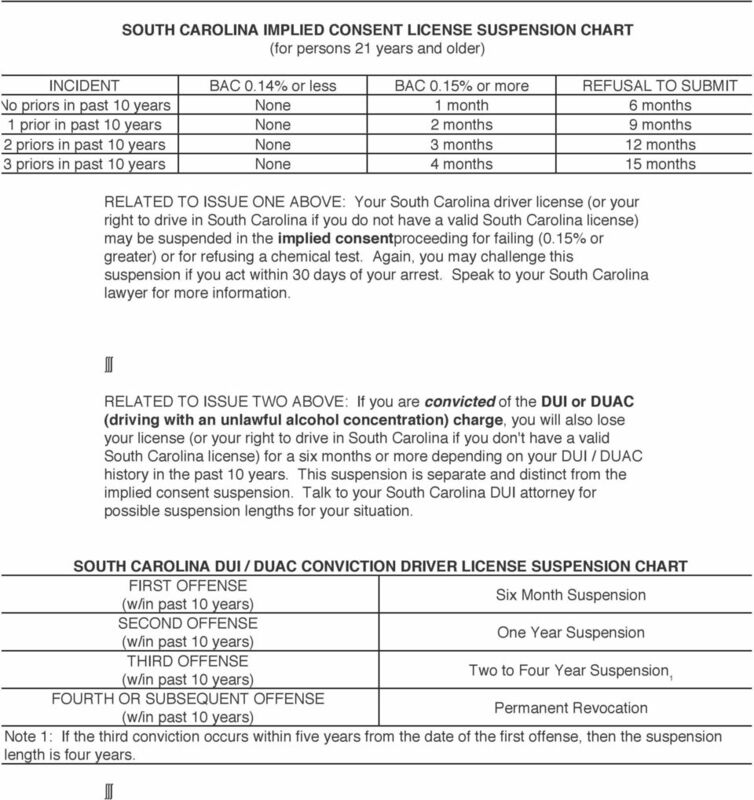 SOUTH CAROLINA DUI / DUAC CONVICTION DRIVER LICENSE SUSPENSION CHART FIRST OFFENSE Six Month Suspension SECOND OFFENSE One Year Suspension THIRD OFFENSE Two to Four Year Suspension₁ FOURTH OR SUBSEQUENT OFFENSE Permanent Revocation Note 1: If the third conviction occurs within five years from the date of the first offense, then the suspension length is four years. 3 Also keep in mind that your SC driver license can be suspended for a variety of reasons unrelated to a DUI arrest e.g. operating uninsured; failing to pay a ticket; driving while suspended etc. What happens if I get caught driving while my license is cancelled / suspended / revoked? Driving while your license is suspended or revoked should be avoided as it is a new crime. Penalties include fines, possible jail time, and an additional license suspension. I really need to drive. Will I be able to get a restricted / occupational / conditional / provisional driver license? If youʼre suspended for first conviction for a DUI or an unlawful alcohol concentration offense, you may be eligible for a provisional driverʼs license if you meet all of the criteria below: 1. You must have or have had a valid South Carolina driver license; 2. You must have no other suspensions (except for an implied consent suspension arising from the same incident); 3. You must be enrolled in the Alcohol and Drug Safety Action Program; 4. You must file an SR-22 with the DMV; 5. You must pay $ fee. Speak to your South Carolina DUI lawyer about whether you qualify and how to apply for a provisional driver license. What is the difference between a DUI, DWI, OWI, OUI etc.? These terms are all acronyms that refer to the offense commonly known as "drunk driving." Different states have different names for the crime. For example, in New York and Texas the charge is known as DWI (driving while intoxicated). Oregon uses the term DUII (driving under the influence of an intoxicant). South Carolina law refers to driving under the influence, so the term DUI is used here. 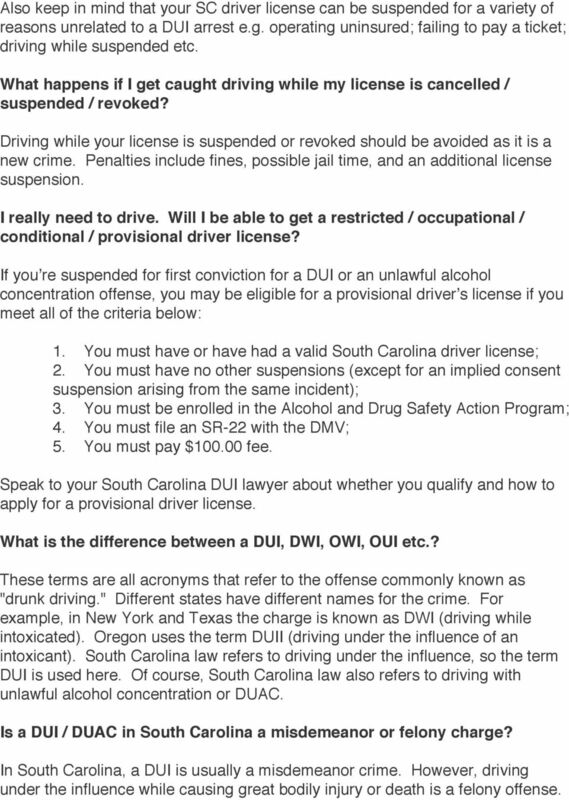 Of course, South Carolina law also refers to driving with unlawful alcohol concentration or DUAC. Is a DUI / DUAC in South Carolina a misdemeanor or felony charge? In South Carolina, a DUI is usually a misdemeanor crime. However, driving under the influence while causing great bodily injury or death is a felony offense. 5 factors, including (but not limited to) the following: your prior driving record especially your DUI history (including any DUI's outside of South Carolina); your level of intoxication / BAC (BAC of greater than 0.10 percent and greater than 0.16 percent will result in greater penalties); whether there was a collision involved; whether there was bodily injury, great bodily injury, or death to another person in the collision; which South Carolina county or court your case is in; what judge you are sentenced by; whether there was a passenger / child in your car (especially a child under 16 which can result in an additional charge of "child endangerment"); whether the judge feels you have accepted responsibility for your actions. I am licensed to drive in a state other than South Carolina and I was cited for a DUI in South Carolina. Will my driver license be suspended? South Carolina only has the authority to suspend your right to drive in the State of South Carolina. However, South Carolina and 44 other states and the District of Columbia have adopted an agreement known as the "Driver License Compact." South Carolina will report a DUI / DUAC conviction to the home state of the driver (assuming that your home state has also adopted the Compact). Your home state will then generally take action to suspend your license. This also works in reverse. If you are a South Carolina licensed driver and you are convicted of a DUI charge in another state, South Carolina will suspend your license if it learns of the conviction. Will I have to install an Ignition Interlock Device on my car? An ignition interlock device (IID) is a breath alcohol measurement device that is connected to a motor vehicle ignition. In order to start the motor vehicle, a driver must blow a breath sample into the device which then measures alcohol concentration. If the alcohol concentration exceeds the startup set point on the interlock device, the motor vehicle will not start. 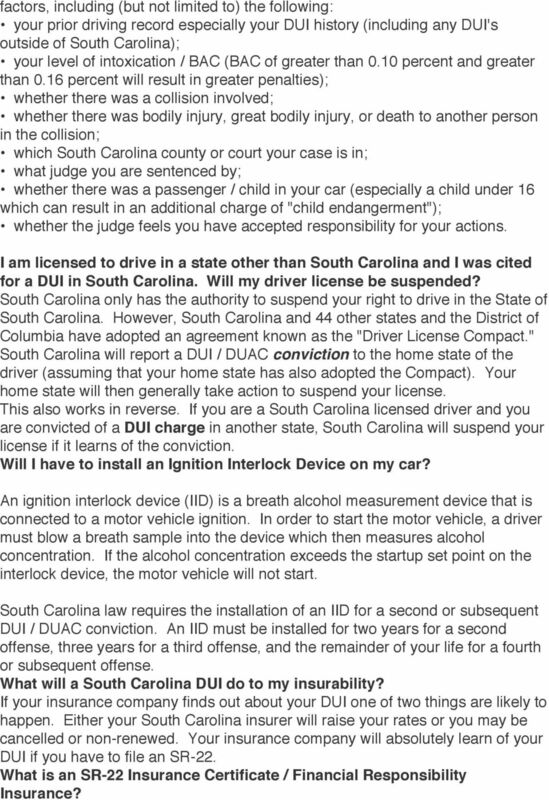 South Carolina law requires the installation of an IID for a second or subsequent DUI / DUAC conviction. An IID must be installed for two years for a second offense, three years for a third offense, and the remainder of your life for a fourth or subsequent offense. What will a South Carolina DUI do to my insurability? If your insurance company finds out about your DUI one of two things are likely to happen. Either your South Carolina insurer will raise your rates or you may be cancelled or non-renewed. Your insurance company will absolutely learn of your DUI if you have to file an SR-22. What is an SR-22 Insurance Certificate / Financial Responsibility Insurance? 6 An SR-22 insurance certificate is a form from an South Carolina licensed insurance company certifying that you have purchased liability insurance that meets the minimum required coverage limits. The SR-22 provides proof to the South Carolina Secretary of State's Office that you are insured. If you cancel your insurance or the insurance company cancels your policy before your suspension period is over, the company must notify the Secretary of State Department of Driver Services that the certificate is canceled. An SR-22 is required three years from the ending date of the suspension or, in some cases, from the beginning date or the compliance of the suspension. An SR-22 is also required to get and maintain a provisional driver's license. An SR- 22 (called a non-owners SR-22) is required even if you do not own a vehicle. 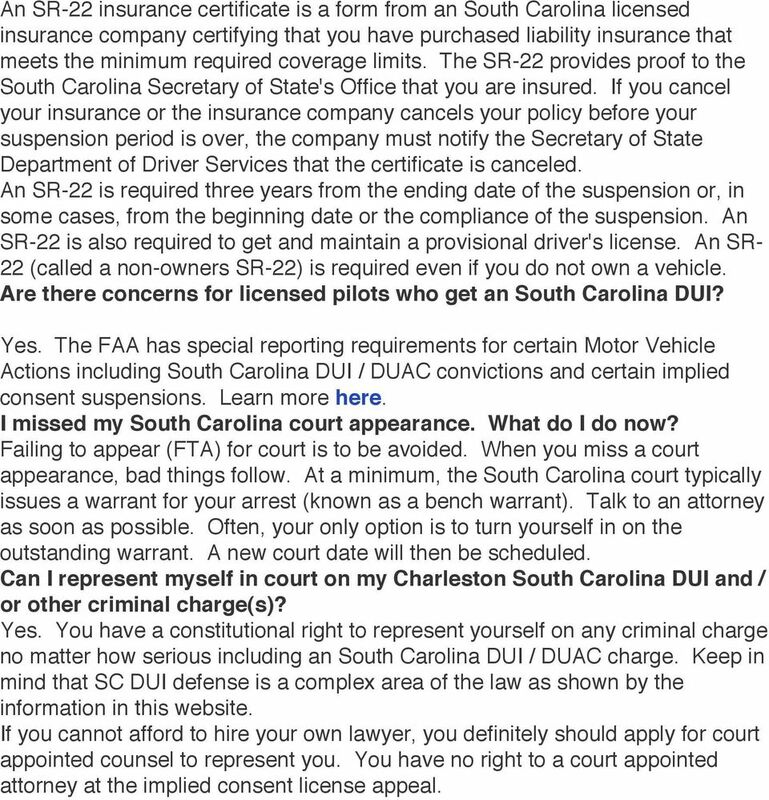 Are there concerns for licensed pilots who get an South Carolina DUI? Yes. The FAA has special reporting requirements for certain Motor Vehicle Actions including South Carolina DUI / DUAC convictions and certain implied consent suspensions. Learn more here. I missed my South Carolina court appearance. What do I do now? Failing to appear (FTA) for court is to be avoided. When you miss a court appearance, bad things follow. At a minimum, the South Carolina court typically issues a warrant for your arrest (known as a bench warrant). Talk to an attorney as soon as possible. Often, your only option is to turn yourself in on the outstanding warrant. A new court date will then be scheduled. Can I represent myself in court on my Charleston South Carolina DUI and / or other criminal charge(s)? Yes. You have a constitutional right to represent yourself on any criminal charge no matter how serious including an South Carolina DUI / DUAC charge. Keep in mind that SC DUI defense is a complex area of the law as shown by the information in this website. If you cannot afford to hire your own lawyer, you definitely should apply for court appointed counsel to represent you. You have no right to a court appointed attorney at the implied consent license appeal. Page 1 of 5 INDEPENDENT DISTRIBUTOR NEWS YOU CAN USE DUI and YOU What Does It Mean and Why You Should Careck Here To Learn What These Top 10 Cla What will a DUI conviction do to my car insurance rates?